I have finally joined the breakfast strata club! This isn’t just any breakfast strata though. It’s a PEPPERONI ROLL breakfast strata. I didn’t even know pepperoni roll strata could be a THING. A few months ago, Lacy and I were discussing things to make on Christmas morning. She said my aunt always makes a strata on Christmas morning, which I knew… but then she dropped the bomb on me. She said that she makes the strata with PEPPERONI ROLLS. That sounded like the most brilliant idea in the universe. And also, how did I not know this? How did I not know that she used pepperoni rolls?! For those of you asking WHAT THE HECK IS A PEPPERONI ROLL… it’s this. It’s basically pepperoni and cheese baked into fluffy bread and it is amazing. It’s so delicious, even if you never cared for pepperoni like me! Last year I made a strata. I made it with kale and gruyere. It was so gross. It was like a soggy, spongy mess. It tasted terrible, it looked worse and it basically threw me off of strata for a good long while. It was a major disaster. 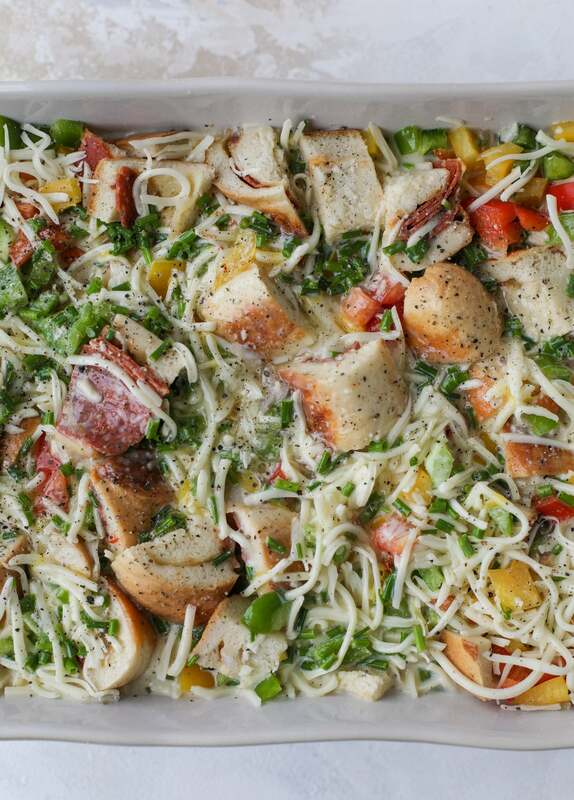 Until this idea of pepperoni roll strata came along and then I’m like OH MY GOSH OF COURSE! P.S. as promised, I have my final holiday playlist for you… a Christmas morning playlist! 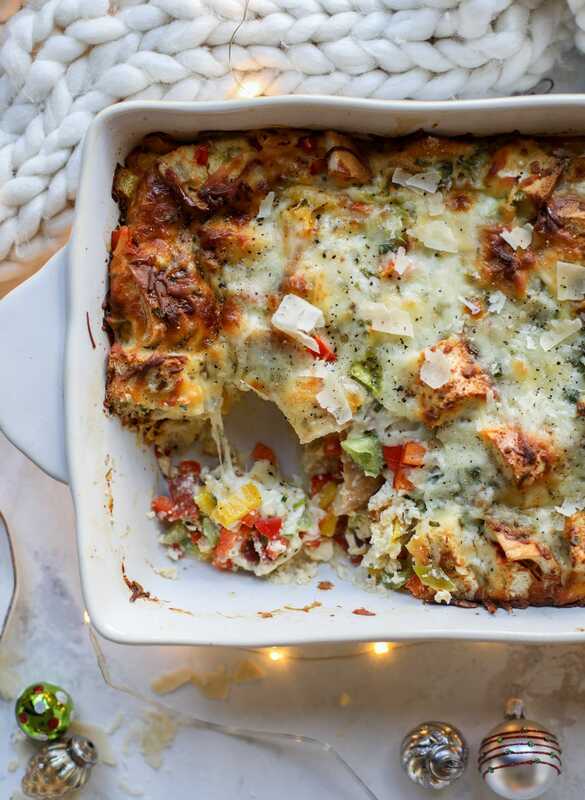 Would be perfect to play while making (and then… eating) this breakfast strata! We have lots of cheese, eggs, of course, peppers, onions, garlic and did I mention cheese? And pepperoni rolls? All chopped up and deliciously crunchy? It kind of tastes like a supreme pizza! You HAVE to make it ahead of time. It has to have time to soak in the fridge. It’s like the tub for strata. It has to have time to come together and get all delicious and close so when we bake it, it’s golden, crunchy, egg perfection. Oh, I mean cheesy egg perfection. Which is fantastic, because it means it’s a great dish to make for holiday brunches! Or breakfasts. Or, I guess you could even make it in the morning and have it for dinner one night? Yes, hello, I love that idea. 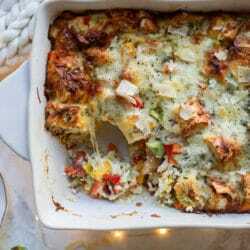 This breakfast strata is super special because the base is built on pepperoni rolls! This make ahead casserole is perfect for holiday brunches or parties and tastes like a supreme pizza. It's so easy to throw together too! Spray a 9x13 inch baking dish with nonstick spray. Place the pepperoni bread cubes in the dish. Stir in the peppers and onions and garlic until evenly dispersed. Stir in the chives and about three quarters of the grated cheeses, leaving a bit to sprinkle on top. In a large bowl, whisk together the milk, mustard, salt, paprika, oregano and pepper together until combined. Pour the egg mixture over top of the mixture. Sprinkle the remaining cheese on top. The next morning, preheat the oven to 350 degrees F. I like to take the dish out of the fridge about an hour before so it comes to room temperature. Bake the strata for 50 to 60 minutes, or until a tested inserted in the center comes out clean. Sprinkle with extra parmesan cheese. Serve immediately with your choice of condiments, like hot sauce or extra fresh herbs! It’s the most festive thing to eat! 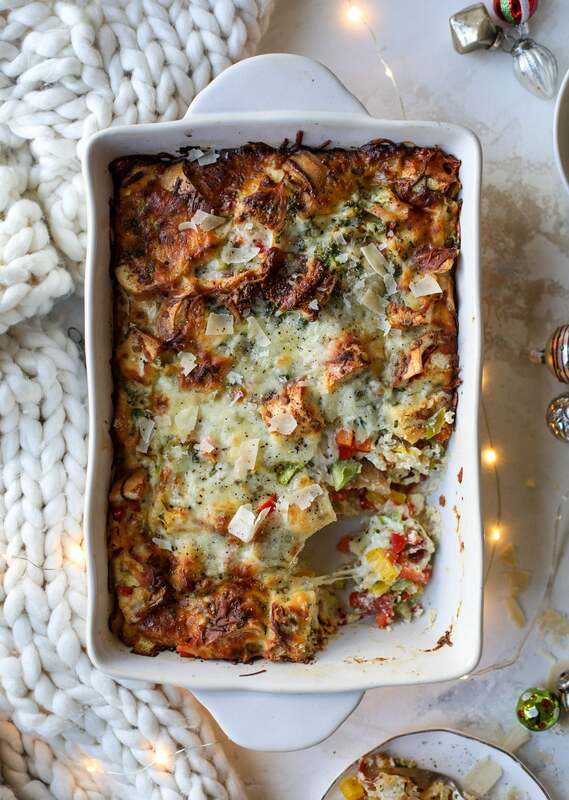 THIS savory strata… oh yes. Hello, pepperoni breakfast magic. yesss it makes it amazing! haha! i had no idea they weren’t a thing everywhere!! Makes me wish pepperoni didn’t give me apocalyptic heartburn! ugh that is the worst!! I have a feeling this tastes amazing. This looks amazing but is there a preferred recipe for the pepperoni rolls? I’ve never heard of that before and my google search brought up many different ones. Pepperoni rolls must be an american thing? Never heard of it in Canada. Weird… Looks tasty though! So confused on how to add an ingredient I’ve nwved heard of! Lol! Pepperoni roll! is a barrier has been made easier here; it is a great blog with amazing knowledge. A great read. I’ll definitely be back. 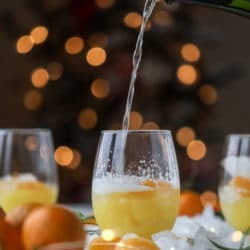 We made this recipe for Christmas “Eve Eve” brunch – it was a huuuuge hit. I didn’t see garlic amounts in the recipe but winged it and it was amazing. We did half without peppers for the picky eaters, I cannot wait to have another reason to make it again. It was awesome. PS – Sunseri pepperoni rolls from the Strip were perfect for this. If only I could buy pepperoni rolls outside of WV! Man, i love pepperoni rolls. This looks absolutely DELICIOUS!!!!!!!! I am definitely going to make this. Do the pepperoni rolls have cheese in them? I don’t think anywhere around me sells them, so I’m searching for recipes. This recipe is perfect for a brunch party.